My review of The Division 2 is currently underway and while it’s too soon to provide any kind of impression or feedback, I return from DC with a few tips for new agents entering the game for the first time when it goes live to the public this Friday. Hopefully this will enhance not only your road to level 30, but your enjoyment of the game as a whole. As soon as you enter your base of operations and is introduced to the perk system in the game, try to use your first batch of SHD points to unlock all of the experience accolade perks. These perks give you extra bonus experience during combat. With all of these accolades unlocked, you get extra experience from headshot kills, multi-kills, kills by hitting enemy weakpoints, kills via environmental objects like gas canisters, and not going down for a good amount of time during an encounter. Squeezing all the experience you can get in each fight is ideal so picking up these kill accolades is the best perk to pick up first when you start playing the game. You’ll also appreciate getting the Deconstruction perk as soon as you can since this perk gives each item deconstruction a chance at more crafting materials when completed. You’ll be breaking down useless gear a lot, so might as well get the most out of it. I would even go as early as saying it’s one of the best. While the healing of the Drone or the Hive are great, the Chem Launcher’s Reinforer variant seems to be the best choice in the early game. You can shoot the healing effect in an area to heal allies or deployed skills. You can even place the healing effect on your character’s location for a quick heal by tapping the skill button twice. But what makes the skill great is that you have three shots and each shot has a low cooldown. I can smell Ubisoft planning some changes to this skill already, so best to make use of it now before that happens. This was the first bad habit I developed when playing the game. When I see something now useless to me, I sell or deconstruct the item. It’s better to mark these items as “junk” and store them until the next time you visit a settlement or your base of operations’ project officer. 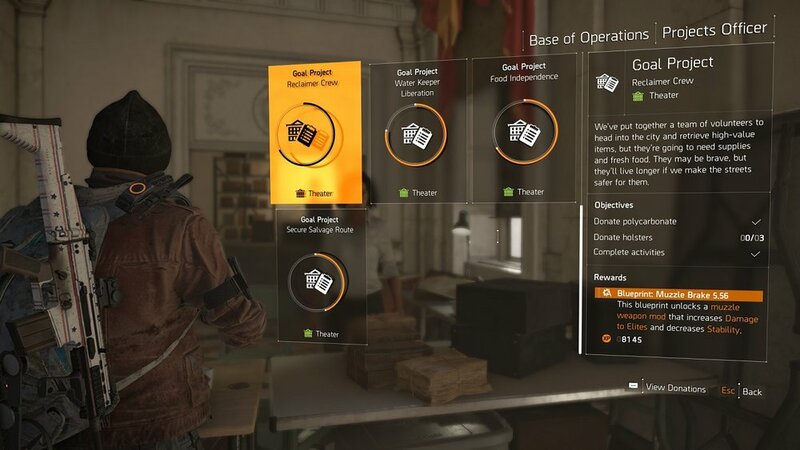 Projects in The Division 2 require you to donate certain items and/or do certain objectives in the open world in order to compete them. 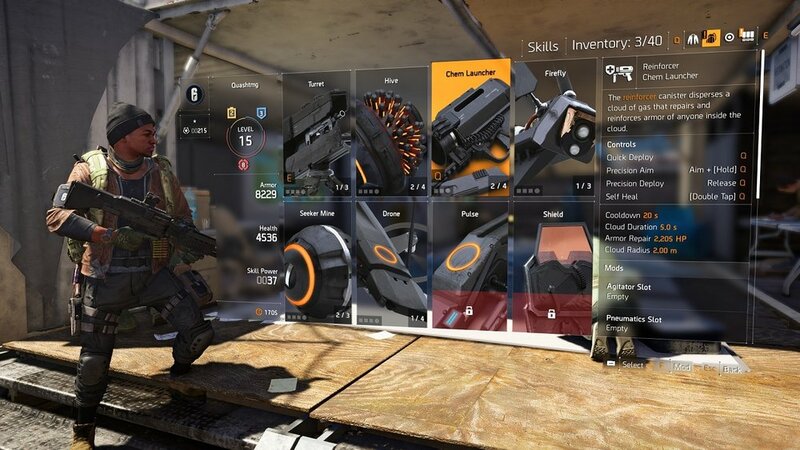 Some may require gear items like a holster or a chest item, so it would be best to check the list of projects before clearing your inventory. Doing these projects are coming out as important and should not be overlooked as the rewards not only provides experience but weapon mod blueprints and more. You can move from cover to cover easily thanks to its automated system, but did you know it’s better to use this feature rather than manually moving your character to another location? 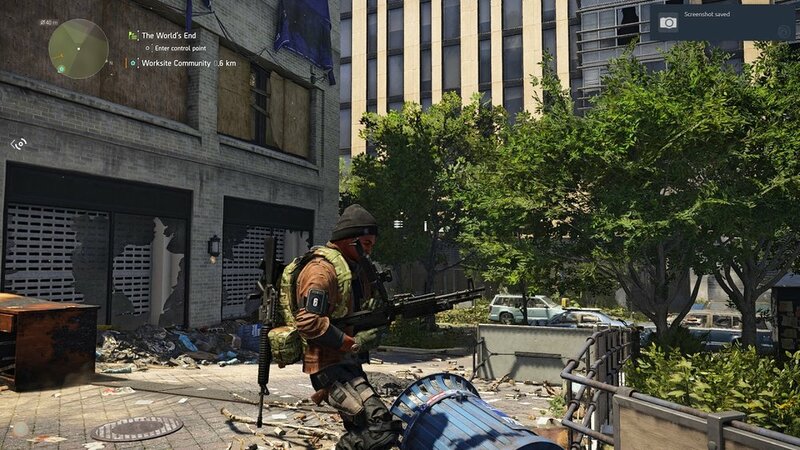 Transitioning from cover to cover with this system was essential in the first game and it's no different in The Division 2. Using the feature gives your character a lower profile while moving to the next cover compared to you manually sprinting to that location, which lessens the chances you’ll get hit when making a move. You also move faster when using this feature, making it the best way to navigate the battlefield. This is for pve at the very least. How the new Dark Zones and PVP will work is still up in the air. Once everybody adjusts with the changes, we’ll see if this system will also be heavily utilized in a competitive field. A bit odd but after a few tests, but it’s the most optimal way for making an advance or getting out of harm’s way. While you are on cover, vaulting through the object during this state has a longer animation than simply removing yourself from the cover first and instantly vaulting over while standing. To remove your character out of cover, simply move back and quickly press the vault button to get the faster animation. It takes awhile to get used to but it helps. it eventually became second nature for me during a fight. Right before the reload bar finishes (there’s a bar that let’s you know when the reload is complete) you can squeeze in a roll animation without canceling the reload. You need to press the roll button when your reload animation is about 30% away from completion. It’s a great tool that will come out useful to those that need a reload but at the same time need to get out of a tight situation, like if you’re being rushed by melee enemies. The timing varies depending on the weapon as some reload faster than others. Plus, you can reduce the reload time of weapons through mods and set pieces, so practice is needed to make this a reliable option during a fight. Once you have the crafting bench available, you’ll eventually come across weapon mod blueprints. The perks will give you access to some weapon mods but Try unlocking these early on once you have enough materials for it, giving you more options when customizing your weapons’ stats as you progress through the game. Take note: Once crafting the mod, you unlock it for your character, allowing you to apply it on any weapon at any time. Weapon mods, or attachments, have a positive and negative stat to balance things out, so mix and match to get the most out of your chosen weapon. For all of you completionists out there - don’t worry. You will not miss out on a side mission if you don’t do it right away. It’s perfectly fine to go through the main missions and save the side missions if you need extra experience to hit the next level. Side Missions scale so the experience you get and the rewards are based on your character’s level. These missions are no longer open world activities too compared to how they were in the first game. Most of them so far plays out like a main mission - complete with a backstory and a bit more engaging scenarios. Don’t forget to upgrade your crafting bench - Once you finish the campaign you’ll be climbing through the World tiers for a shot at stronger gear. And eventually you’ll have enough materials to craft your first exotic. Well, before you do any crafting, make sure you upgrade your crafting bench to the highest World Tier, which is currently at 4. The last thing you want is an exotic weapon you can’t even use. Look out for supply drop crates dangling above - Look up every now and then when roaming the streets of DC. We’ve encounters trees with crates stuck in them, even cranes with a supply crate. Shoot them and they will drop their contents on the ground. These are where you can pick up dyes for your armor. So far we know it drops most of the time, so keep a look out. Loot the supply room after each Control Point capture-You get experience and a piece of gear when you’ve successfully captured a Control Point but don’t move on just yet! There’s a supply room unlocked for your troubles that contain multiple chests with a big one that most of the time provides solid loot. The game indicates where the room is located. When you hit endgame, the game expands how Control Points work, so expect more when you hit that point. Almost all side quests provide a weapon attachment blueprint - Aside from side quests providing a good narrative and mission structure, most of them reward you with a weapon attachment blueprint for all your troubles, instantly making it worth the detour. Attachments are important to build your preferred weapon and the more options you have the better. Know exactly when your skills will be ready to use again - head to the settings and make sure you turn on “Numeric Skill Cooldowns”. With this turned on, you not only have a bar showing when the skill will be ready but now also a countdown so you can be more aware of your options during a fight. We’ll update this guide as we continue through the game. We are now at endgame and new features are popping up. There’s still a lot to take in and hopefully this helps with your first run through Washington DC. The Division 2 is now available on PS4, Xbox One, and PC.